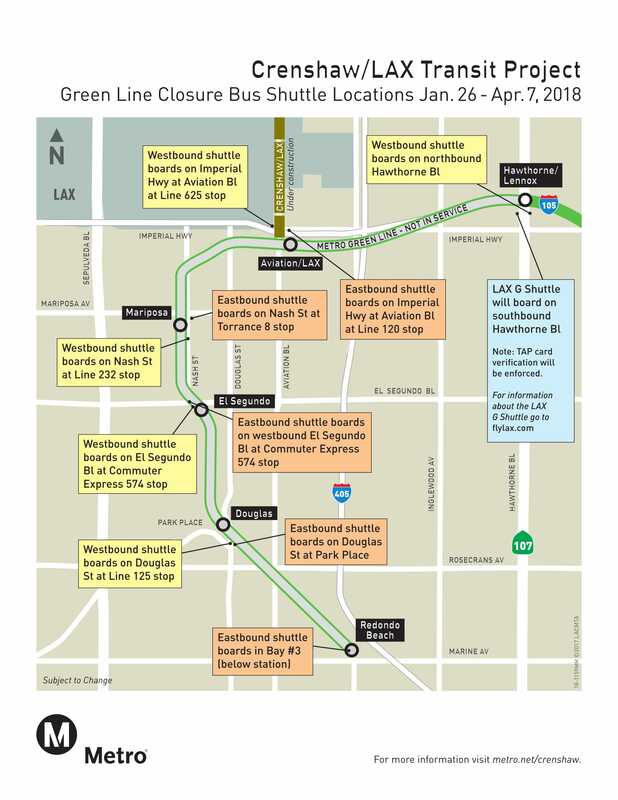 On Friday, Jan. 26 Metro will begin work on connecting the Crenshaw/LAX Line and the Green Line tracks. The work will require a 71-day closure of five Green Line stations: Redondo Beach, Douglas, El Segundo, Mariposa and Aviation/LAX Station. Service will be maintained through free bus shuttles in place of Green Line service between Hawthorne/Lennox and Redondo Beach stations during the closure. Bus shuttles will stop at all stations and run as frequently as the Green Line. For those planning to travel to LAX Airport during this period, the LAX Shuttle G bus will operate from Hawthorne/Lennox Station instead of its usual stop at Aviation Station. In addition to work on the rail junction between the Crenshaw/LAX Line and the Green Line, Metro is using the closure to make track and signal upgrades to the Green Line as part of the agency’s State of Good Repair program. Thank you for your patience as we get one step closer to the completion of the Crenshaw/LAX Line, which is scheduled to open in fall 2019.